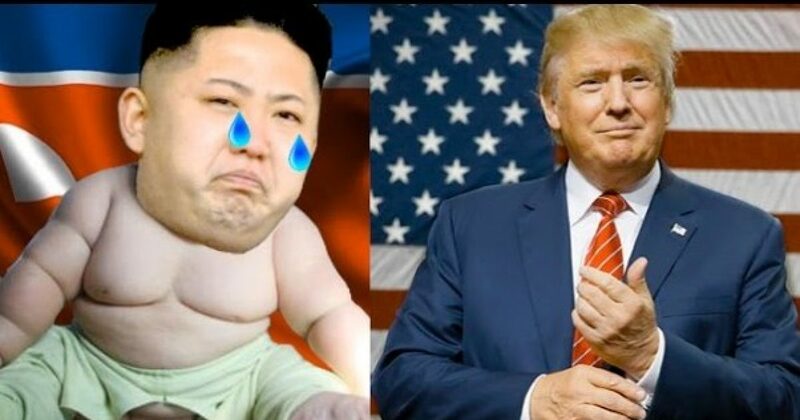 Due to the crippling effects of President Trump’s newest sanctions against North Korea and its cash reserves drying up rapidly, Kim Jong Un is crying uncle, suddenly promising peace, denuclearization, and renewed efforts toward reunification with South Korea. Kim promised to not use nuclear or conventional weapons against South Korea and expressed willingness to hold talks with the United States on denuclearization, Seoul said on Tuesday after a rare two-day visit to Pyongyang, according to Fox News. The Hermit Kingdom added that it’s willing to give up its nuclear weapons if military threats against North Korea subsides, South Korea’s presidential national security director Chung Eui-yong said in comments hours after leaving Pyongyang. “The North side clearly affirmed its commitment to the denuclearization of the Korean Peninsula and said it would have no reason to possess nuclear weapons should the safety of its regime be guaranteed and military threats against North Korea removed,” Chung said in a statement, according to Yonhap News Agency. Chung, who led a 10-member South Korean delegation to Pyongyang for the two-day visit, said the North is ready to have “heart-to-heart” talks with the U.S. about the regime’s potential denuclearization and normalization between the countries. “It made it clear that while dialogue is continuing, it will not attempt any strategic provocations, such as nuclear and ballistic missile tests,” the statement continued. North and South Korea agreed to hold summit talks in April at the border. The leaders will establish a “hotline” communication channel to lower military tensions, Chung added. The comments mark a major change in tone after months of bombastic threats by the rogue regime to keep developing its nuclear and missile program. Last month’s Pyeongchang Olympics sparked the first talks between the two Koreas that followed a flurry of cooperative steps taken to ease tensions during the Winter Games. North Korea sent a delegation of athletes, cheerleaders, art troupe and officials to Pyeongchang for the Olympics. Kim’s sister, Kim Yo Jong, labeled by the South’s media as “Kim Jong Un’s Ivanka,” attended the opening ceremony and met with South Korean President Moon Jae-in over a three-day visit. At one point, she even wrote of her “wishes” for closer ties in a guest book at South Korea’s presidential office. “I expect Pyongyang and Seoul to get closer in the hearts of our [Korean] people and the future of unification and prosperity will be advanced,” Kim wrote in Korean in the guest book, according to Yonhap News Agency. But the “future of unification” phrase means something far more sinister for the Kim family and his regime. North Korea has touted unification as a “final victory” to the Korean War that ended in an armistice in 1953. In Pyongyang’s view, “unification” means Kim’s brutal dictatorship would overcome the South’s government. There have been two summits, one in 2000 and another in 2007, held between Kim’s late father, Kim Jong Il, and two liberal South Korean presidents. They resulted in a series of cooperative projects between the Koreas that were scuttled during subsequent conservative administrations in South Korea. Kim’s apparent olive branch to South Korea and the U.S. comes after months of mounting sanctions against the volatile regime. Kang Seok-ho, of the Liberty Korea Party, previously said the despot is scrambling to keep his regime afloat best the international sanctions was crippling his economy. Secretary of State Rex Tillerson also said in mid-January there was “a lot of evidence that these sanctions are starting to hurt” North Korea.